Hello again. It's Fri-YAY. I so love the weekend. Any plans? It has been really cooling off here, enough at night that it is almost time to put the second blanket on the bed. My husband and I both like it cold in our bedroom...to hard to sleep when you are hot. Well on to my card. 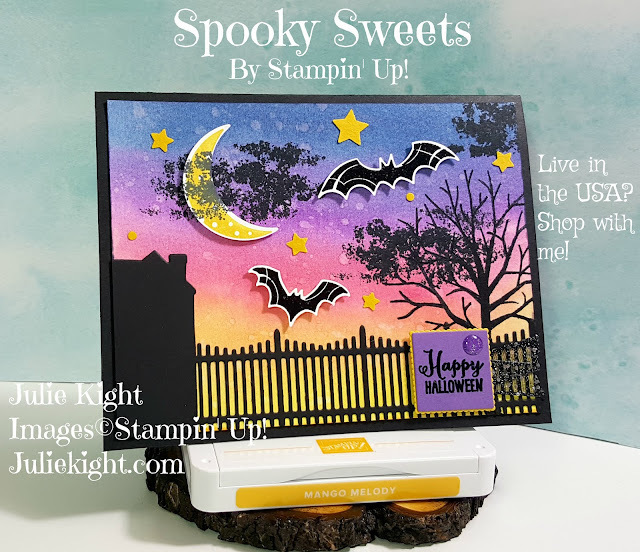 I made another watercolor card using the Spooky Sweets Bundle. This set is so much fun and can be used in so many ways. I absolutely love watercoloring, because each time you do it it is always different. I started with the darkest color and worked down to the lightest. A tip.....make sure you watercolor paper stays wet or you don't get a good blending. I used the Farmhouse Framelits for the fence and house. I wanted them in black so it gave the look of being silhouetted. The black also lets the background really pop. I stamped the cloud stamp into the moon to make it look like the clouds were passing around it. I also heat embossed the bats for contrast. Hey everyone. Last week I turned 48 and I wasn't to sure how I would feel about that as I inch closer to the big 50, but I received two amazing gifts this year. First, my older son made me an amazing Chicken Enchilada dinner, then second, my younger son told me he was making me a GRANDMA!!! I am so elated...my first grandchild! I am over the moon excited! On to today's card. I love to watercolor so I decided to create a Halloween colored background. 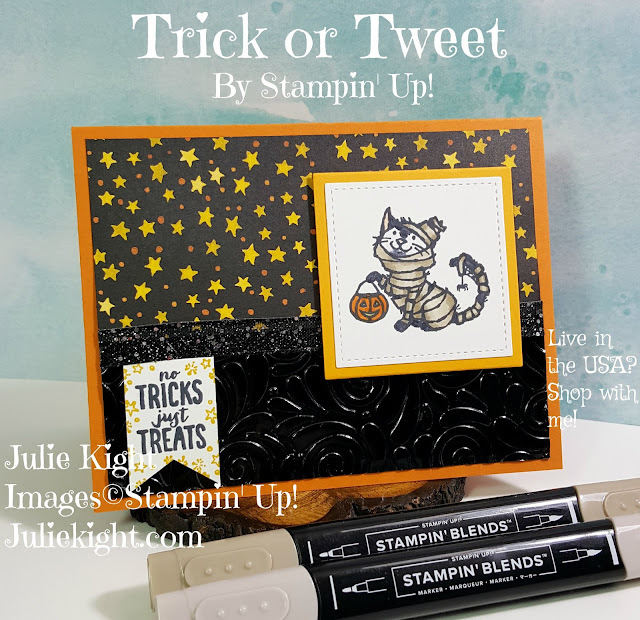 I have been wanting to use this really cute Cat Punch on a Halloween card and believe it or not this card design popped into my head one night while I was laying in bed. And when I saw the new Black Foil paper I knew that was what I wanted to use. I simply embossed the paper first then punched it out. Hi and welcome back to my blog. It's Friday.....Yea. Any plans this weekend? I'm just going to work on my craft room as it has gotten a little messy. With having the neck surgery I have had to let some things go as I am not aloud to do certain things. So I am going to work on that. Today for you I have a combo of two stamp sets on one card, Peaceful Noel and Farmhouse Christmas. I used the Seasonal Wreath TIEF and then decided to paint the smaller leaves with the new Copper Shimmer Paint. 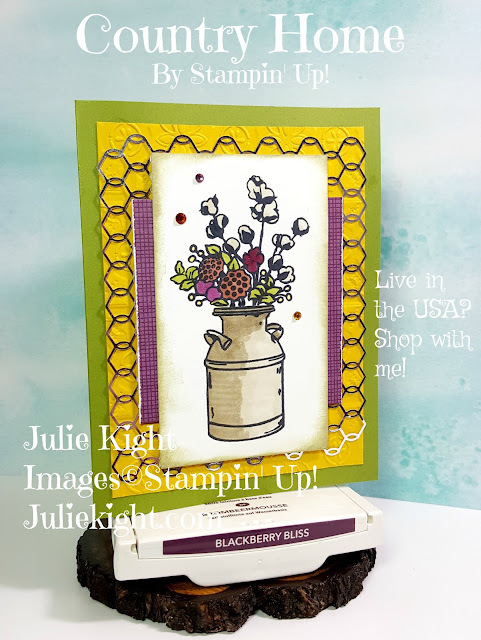 Then I embellished it a little more by coloring some Basic Rhinestones with the Dark Cherry Cobbler Stampin' Blends and placing them around. Hello again! How are you all doing? I am still improving each day from neck surgery. Halloween is my most fave holiday of the year.....Christmas is a close second. Even before Summer has ended I'm thinking of how I am going to decorate my home for Halloween. To make it even more fun, it's my husband's fave holiday too! On to my card. 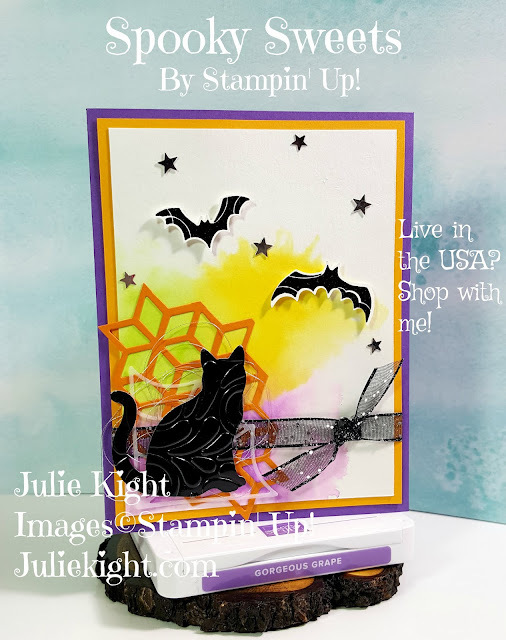 Today I have a Halloween card using a stamp set from the new Holiday catalog.....Trick or Tweet. When the Blends first came out I can honestly say wasn't to sure if I was going to get them. Then in July my Team Leader used some in a class she was having for her team and I instantly fell. in. love. with them! I'm slowly getting them all. For this card I used a few and my husband was quite surprised when he realized I was the one who colored the mummy cat! Welcome all. How is your Monday going? I have a Dr appt today, but the rest of the day I'm creating. Healing from neck surgery is improving, still have swelling in my throat but it doesn't hurt to swallow anymore. 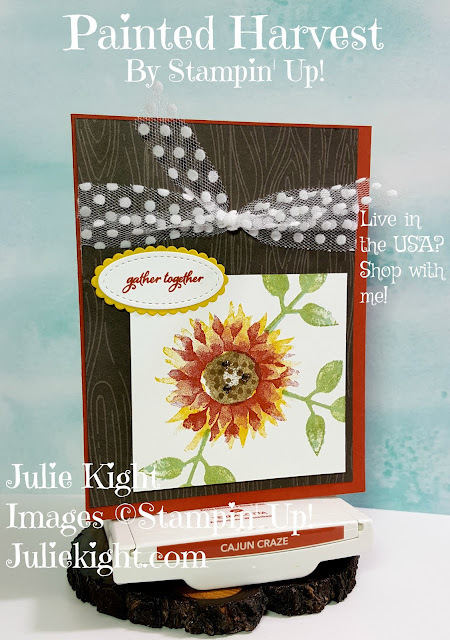 For today's project I have a card that I created. I honestly didn't have this envisioned before I started. I did have a sketch from a challenge to start with and this is where it went. 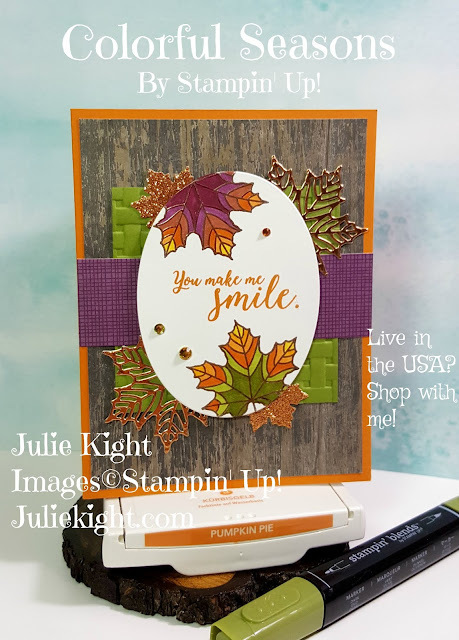 I started with the embossing and then decided to color the leaves in with Fall colors using the Stampin' Blends which are amazing to use. One end is a brush and the other is a point. The embossing makes it easy to stay within the leaves as well. The foiled and glitter leaves add so much. 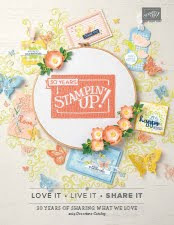 And I love the Basket Dynamic Textures Impressions Embossing Folder. 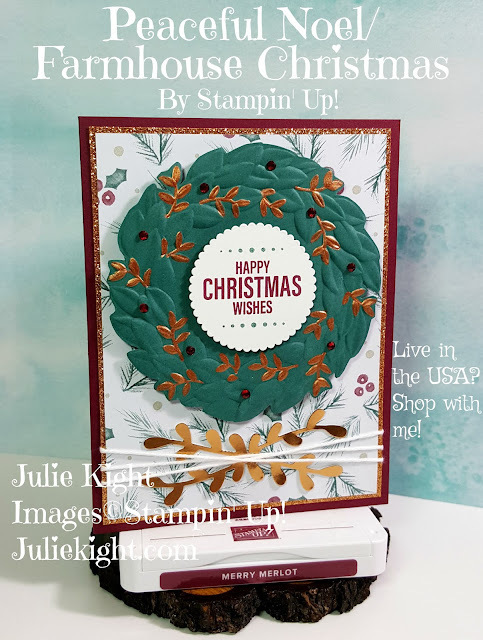 A tip...spritz a little water on the paper first so it allows the paper to be molded into the embossing folder better. This keeps the paper from cracking and splitting. 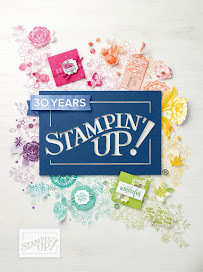 When using the Stampin' Blends you need to use the Tuxedo Black Memento so that the black don't bleed. I used colors of Fall to color the flowers. Also, another very popular item from the Holiday catalog has been these Chicken Wire Elements. One side is silver colored and the other is white so you can easily color them any color. And you can cut them apart so if you don't want to use a whole sheet on something you have that option.